At yesterday's Gov2.0 Summit conference, "rogue archivist" Carl Malamud gave a great speech about what's wrong with government IT and what should be done about it. Continue reading "Rogue Archivist" Carl Malamud On How to Fix Gov2.0 . . .
Those of you interested in transparency and "Government 2.0" issues will absolutely want to pick up Open Government: Collaboration, Transparency, and Participation in Practice, a terrific collection of 34 essays edited by Daniel Lathrop and Laurel Ruma. Much like Access Controlled, the collection of essays on global Internet filtering and censorship that I praised here last month, Open Government is a resource like no other in its field. It offers an amazing diversity of viewpoints covering virtual every aspect of the debate over transparency and open government. 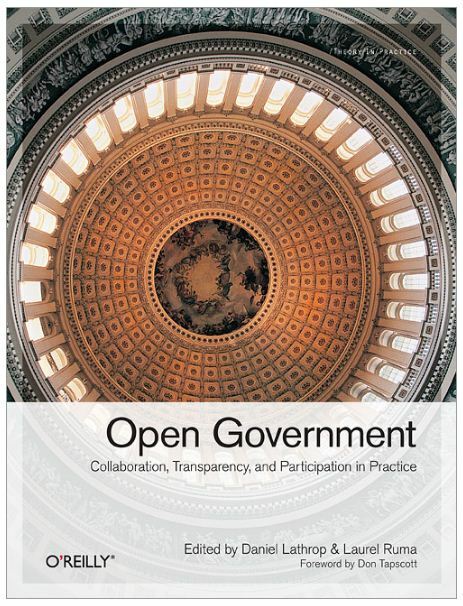 Continue reading Good Resource: Open Government: Collaboration, Transparency, and Participation in Practice . . . I've complained mightily (here and here) about the agonizing technological awfulness that was, at least until recently the website of the FCC (you know, one of the two federal agencies--besides the FTC--that thinks it has the expertise necessary to regulate the Internet). My point wasn't just that the FCC's website made it very difficult to find and access data, but that this was a serious problem for transparency in government. I have to give the agency credit for improving many aspects of its site, though much work still remains to be done. The Commission's securities disclosure processes are technologically backward. It reviews corporate filings manually, using printouts, pencils, and calculators. It has never developed the ability to perform large-scale quantitative analysis to find fraud. Commission staff use Google Finance, Yahoo! Finance, and other commercially-available resources to analyze corporate filings. If the Commission had a robust database of the financial information filed by its registrants, it could automatically prioritize the thousands of tips and complaints it receives. But no such database has ever been constructed. Hence the biting title of the report: The SEC: Designed for Failure. Ouch! It's really amazing how, when regulators fail to protect consumers, the default response by most in Congress is to assume that only sweeping new powers will fix the problem (which is what "financial reform" legislation would do) instead of, say, bringing the agency into the 21st century. Similarly, there's a move afoot to give the FTC vast new powers across the board or to protect our privacy online (from evil companies that don't respect the privacy promises they made to consumers) with little thought given to data-driven technological through user empowerment. Continue reading Government Transparency & Smarter Regulation through Standardized Data Use . . .
Two Cheers for the Treasury Department on Internet Freedom! The Treasury Department today announced that it would grant the State Department's December request (see the Iran letter here) for a waiver from U.S. embargoes that would allow Iranians, Sudanese and Cubanese to download "free mass market software ... necessary for the exchange of personal communications and/or sharing of information over the internet such as instant messaging, chat and email, and social networking." I'm delighted to see that the Treasury Department is implementing Secretary Clinton's pledge to make it easier for citizens of undemocratic regimes to use Internet communications tools like e-mail and social networking services offered by US companies (which Adam discussed here). It has been no small tragedy of mindless bureaucracy that our sanctions on these countries have actually hampered communications and collaboration by dissidents--without doing anything to punish oppressive regimes. So today's announcement is a great victory for Internet freedom and will go a long way to bringing the kind of free expression we take for granted in America to countries like Iran, Sudan and Cuba. But I'm at a loss to explain why the Treasury Department's waiver is limited to free software. The U.S. has long objected when other countries privilege one model of software development over another--and rightly so: Government should remain neutral as between open-source and closed-source, and between free and paid models. This "techno-agnosticism" for government is a core principle of cyber-libertarianism: Let markets work out the right mix of these competing models through user choice! Why should we allow dissidents to download free "Web 2.0" software but not paid ones? Not all mass-market tools dissidents would find useful are free. Many "freemium" apps, such as Twitter client software, require purchase to get full functionality, sometimes including privacy and security features that are especially useful for dissidents. To take a very small example that's hugely important to me as a user, Twitter is really only useful on my Android mobile phone because I run the Twidroid client. But the free version doesn't support multiple accounts or lists, which are essential functions for a serious Tweeter. The Pro version costs just $4.89--but if I lived in Iran, U.S. sanctions would prevent me from buying this software. More generally, we just don't know what kind of innovative apps or services might be developed that would be useful to dissidents, so why foreclose the possibility of supporting them through very small purchases? Continue reading Two Cheers for the Treasury Department on Internet Freedom! . . .
Just the other day, I complained about the fact that New York Federal district court overseeing the Google Books settlement apparently doesn't plan to webcast the final public hearing that will take place on February 18 in this hugely important case about the future of digital books and copyright. Now I discover that the 11th Circuit Court of Appeals (which covers Florida, Georgia & Alabama) has issued a decision with even more far-reaching applications--allowing prosecutions for online obscenity distribution according to local "community standards" wherever a user might have downloaded the material--without even publishing the landmark decision! United States v. Little concludes that Internet obscenity distribution prosecutions may rely on the community standard of the place in which the material was distributed -- which means the government can try to download the material in the most restrictive community, and prosecute the distributor there. Continue reading Major Decision on Community Standards for Internet Governance & More on Judicial Transparency . . . Final Hearing on Google Books Settlement on February 18--But Not On Web? So of course this profoundly important public hearing is going to be livecasted, right? Unfortunately, I don't think so. Continue reading Final Hearing on Google Books Settlement on February 18--But Not On Web? . . .
Last Friday, the Los Angeles Times published a review that called William Patry's new book, Moral Panics and the Copyright Wars, "a choppy and directionless narrative, sometimes illuminating but too often scattershot, unoriginal and strident. Unsupported claims abound." Since Mr. Patry's own blog, Moral Panics and the Copyright Wars, has refused to acknowledge or reply to this review, (thus aping its quivering-lipped silence toward certain other critiques), I will note some of the review's high points--especially since it scooped me on a point that I was saving. Continue reading The L.A. Times and Huffington Post Blast Patry's Moral Panics and the Copyright Wars . . . The chairman asked panelists to think about the value of a clearinghouse where best practices could be shared. He suggested that might be a way to spur the spin-off of public-sector apps from private sector initiatives and to prevent reinventing the wheel, rather than tapping into what is already being done. There is not a lot of shared info out there, he said. If all we're talking about is a clearinghouse that provides easy access to apps for government-developed apps, Google Code or SourceForge may be a better model than iTunes--though perhaps without the instant name recognition by ordinary consumers. Like SourceForge, Google Code allows hosting and management of open source projects, including Google's own products. iTunes, by contrast, essentially offers consumers finished apps. Also, iTunes is a stand-alone piece of software, of which the Apps Store is just one part, while I can't imagine why Genachowski's "store" need be anything more than a website. All apps should be open source and available to all users to use as they see fit. The store should be limited to apps developed by government employees to meet the needs of government agencies. Continue reading Software: the Public Option? 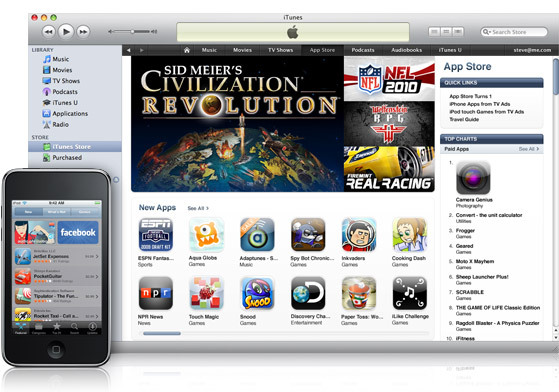 Genachowski's Government iTunes Apps Store . . . I vented my frustration earlier today with the FCC's failure to make comments it receives easily accessible to the public--which means, more than anything, making them full-text searchable. This may seem like Inside Baseball to many, but it's not. It's a failure of the democratic process, a waste of taxpayer dollars, and a testimony to the general incompetence of bureaucracies, regardless of who's running them. It denies the public an easy way to follow what goes on inside Washington, while essentially subsidizing law firms who get to bill clients for having paralegals or junior associates do things that existing web technology makes completely unnecessary--like reading through every comment in a document (at the rate of hundreds of dollars per hour) instead of just looking for keywords in a full-text search. A "crowdsourcing platform" to discuss the administration's plan to transfer nearly $8 billion from taxpayers to broadband providers. I'm thrilled about the RSS feeds, which go a long way in letting all Americans know what the FCC does, supposedly in the "public interest." Still, I can't help but note that the FCC waited until after a huge discussion about whether RSS is dead to finally start using RSS in a serious way--fully a decade after the birth of the RSS standard. Better late than never, I suppose. FCC Connect is also good news: once you have an RSS feed, there's really no reason not to pipe that feed into as many platforms as possible--which is precisely why RSS isn't dead, even if most people will never use an RSS reader. But I'm less thrilled about the crowdsourcing platform. Continue reading More on the FCC's e-Government Transparency Efforts: ECFS, RSS, Social Media & Setting Priorities . . .
Continue reading The News Frontier: Innovation in Journalism Is Hard but Necessary . . .
Ron Paul's Federal Reserve Audit: Why Not Mandate Data Disclosure in XBRL? "Will Obama Have A Computer?" Seriously? Obama's CTO: Fixing Government IT or Setting Nationwide Policy? - Two Cheers for the Treasury Department on Internet Freedom! - Final Hearing on Google Books Settlement on February 18--But Not On Web?